NPH did this thing! NPH did lots of things! NPH gave us a life story! And it is so damn AWESOME! Because then he went and narrated it and made it even more AWESOME! I don't often read (or rather in this case, listen to) autobiographies. In fact, I'm sure I haven't touched a non-fiction book since I graduated from college years ago. Fiction is just so much easier to just melt yourself into. Which is probably why I chose to listen to NPH's autobiography rather than sit and read it, even IF I had a good inkling I would enjoy it whether I read the written book or listened to the audio book. And honestly, despite some moments that I thought kind of dragged a bit, I still thoroughly enjoyed NPH's life story--how much of it is true and how much of it is exaggerated and how much of it was simply a part of his humorous "Choose Your Own Adventure" formatting to elicit loud guffaws from me doesn't even matter. The entire telling of his life story was entertaining at all the right points, hilarious at all the right points, and even managed to make you seriously think about his life and your own life and lots of other people's lives around you because a lot of the things he presents are very insightful. And to be honest, I have never really followed pop culture and the only thing I truly know about Neil Patrick Harris is whatever I've known about his fictional characters from Doogie Howser to Barney Stinson. I knew that he hosted award shows, but because I don't really follow many actors or actresses or their careers, I didn't know that he'd been a big hit in on-stage theater or Broadway. But it's extremely impressive and made me very glad I picked up his autobiography. I knew the name of the man he'd married, but I hadn't known that he had a set of twins (one boy and one girl) and that he's so sweet around them. I love his natural comedic timing and wit, I love his random, sometimes bemusing side quips, and I loved that even Neil Patrick Harris isn't immune to tacky dialogue or lame jokes. It all shows in his book. All of which just further made me love NPH and love his autobiography so much more. I haven't laughed so hard at a book in a long time. And my only conflict about this book right now is whether or not I should just go ahead and get the actual hard copy format and read NPH's "Choose Your Own Autobiography/Adventure" the way it had been intended to be read. 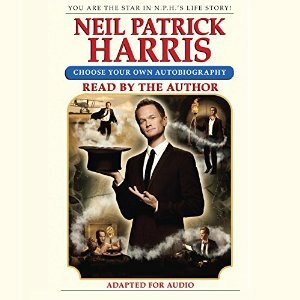 Except that I don't regret listening to the book in audio form because between the anecdotes told and NPH's narration, the entire thing was just a delight. This is definitely not a critical review; this is just me squee-ing about how much I loved and enjoyed this book and how much I think it is the most awesome of awesome! This review was originally posted at Ani's Book Abyss / BookLikes in June 2015.